Free Trial is not Free. They will ask you to deposit money then charge you during free trial. 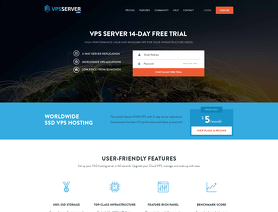 I signed up for a 14-day free trial to see how well this VPS performs. I thought I wouldn't have to spend anything since this is a free trial but when I finished choosing my server, it wanted to charge me $30. This already should have given me a red flag but I decided to ask their support about it to get some clarification. They told me that the $30 will be deposited to my account balance but I will not be billed. I hesitated because this was supposed to be a free trial. I went against my better judgement and decided to continue with the "free" trial. My server setup was a 4 core i7 CPU with 2GB RAM, 100GB Disk space with 3TB data transfer allowance. I chose the "Forex OS" option with Windows 2016 as my server. This setup was supposed to come with MT4 preinstalled but when I first logged in, MT4 was nowhere to be found. This was the second red flag. I again contacted chat support and they had to login to my server to manually install MT4. When I checked again, they installed MT5 which does not work with some Forex brokers. I decided to manually download and install TradersWay MT4 instead. Then I decided to test the capability of the server. Downloaded and installed two more MT4s from two different brokers. So now I have TradersWay, Forex.com and FXCM instances of MT4 running. It's important to note that I have been able to successfully run these 3 MT4s simultaneously on my corei3 laptop with 2gb ram and on a 5mbps connection with other programs like Chrome and Outlook running as well plus other background programs. It never came to the point that I had to restart my core i3 laptop because of a non responding system. On their VPS server, the system would stop responding after a few hours and I had to reboot the server! I even checked the CPU usage and the maximum it ever got was 40%! I started to wonder whether they were somehow limiting the usage. Anyway, I just let that pass and decided to run just two instances of MT4 which was running just fine. "Your account has been automatically excluded from a Trial based on our Risk decision. To compensate you i can add free credits to your account. These credits equal a 14-day trial." If you read their terms and conditions before you sign up for a trial, you will not see anywhere in the document stating that you will can be excluded from the free trial based on a "Risk decision". I think the $30 deposit was just a ploy to get my money in an account balance that they can automatically charge without your permission.